How do I navigate the Menu? The menu is designed to be simplistic and understandable in order to ensure this highest level user satisfaction throughout their entire experience reducing the learning curve in getting started. 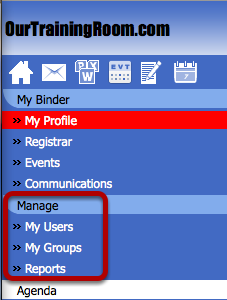 The above represents the standard user menu in which all users have access to. In most cases the two primary areas of concern are the contents within My Binder (#1) and that of the Agenda (#2). 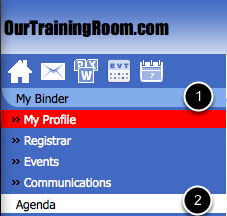 My Binder is a collection of tools that allows you to see a historical account of your entire training related activities, it allows you to manage your personal profile, and access any elective or classroom based materials available to you. Your AGENDA will contain a list of any and all outstanding training courses that have been deemed as being required for you to complete. If your AGENDA is empty (as depicted above), this is an indication that you've completed all required materials assigned to you. If you've been identified as a Manager within the system, you will be presented with additional options for managing your users along with the option generating any number of reports available based on the progress of those users. You will find more information within the section named Managing your Users. Available to you are the above options contained within your menu. Home; At any time during your training session, you may chose this option to return to your initial dashboard. Messages; Access the list of all internal messaging sent to and from the system. This will often contain all of the email notifications and reminders generate from the system. Communications; This link will provide you access to all of your Bulletins, Policies and Procedures, and/or Surveys that have been directed to your attention. Events; A quick link to access all of the Meetings, Classroom Training, or Conferences that you have access to. Reports; A quick link allowing you to navigate directly to the reports manager provided within the system. Previous Page: How do I obtain Support? Next Page: How do I access a Course?